"The last Thursday of every month, Sinking Ship hosts Trivia Obscura, a Family Feud style trivia game that’s as useless as it is offensive. Come test how much crap you have stored in your brain while enjoying craft beer and great company." The fence enclosed patio out the back door of this SoBro bar provides a shady spot to enjoy lunch under the umbrellas during the day and a nice outdoor dining experience at night. And this punk-owned bar boasts an incredible menu, from slants on classic bar food to specialty dishes. Food specials throughout the week include Burger Mania Mondays, where each burger, including the four different stuffed ones, the black bean and the vegan, is half-price. Check in each day for a different daily dish and drink deal. Indiana craft beer and breweries always have a crazy amount going on. Here is your weekly rundown. The results are in and here are your 2017 Best of Indy winners in the Food and Drink categories. Scroll through and find out who garnered the most votes by NUVO readers and earned the title "Best of Indy" in everything from beer to baklava. From night bikes to slow food, karate to CAFOs, it's a weekend chock-full of cultural goodies. And we haven't even mentioned the Indian tacos or local brewskies yet. Barfly: Save the Sinking Ship! One of my favorite pub/restaurants is in danger of extinction. 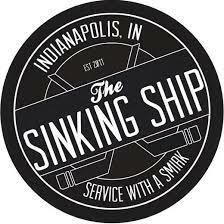 A group of killjoy citizens are doing their best to take away the liquor license of The Sinking Ship. — including a grandstanding mayoral candidate — to live on as a popular nightspot. Earth House, Sinking Ship and others are offering substantial vegan selections. Nick Selm caught the first concert held at the Sinking Ship, Off With Their Heads, on Sunday, October 21. Ancient Slang, Fire Moose and Todd Heaton's Street Spirits performed at the first Wasted Wednesday of 2013 -- which was also the first at the Sinking Ship. The Sinking Ship hosted the first Wasted Wednesday of 2013 with Ancient Slang, Street Spirits and Fire Moose. Ohio rockers close tour with free show at Sinking Ship. We've got the skinny on Ezra's Enlightened Cafe, Indy's first raw vegan, gluten-free, non-GMO restaurant, plus 5 great vegetarian spots to try this weekend. Plan your party path for New Year's Eve. The announcement of Ohioan Pat Tiberi’s eminent departure follows on the heels of U.S. Sen. Ted Cruz’s pronouncement that the GOP is courting an electoral disaster of epic proportions. Festivals of canned beers, pumpkin beers, just good 'ol beers and more are coming this fall. Girls Pint Out, HorrorHound, meads, ciders, pumpkin beers and more are headed to Indy over the coming months. The best events taking place around Indy. Five stars for this war biopic. The collaborative brewery from Three Floyds and Mikkeller is bringing its three main beers to Indy. Another Indianapolis business, this time a popular north side hockey bar has closed its doors. — and the rest of us — before it's too late. “Don’t piss me off because I will market you out of office” marketeer.